Taco Dip. At any party or gathering, I’ve been to it is always one of the first appetizers to disappear. 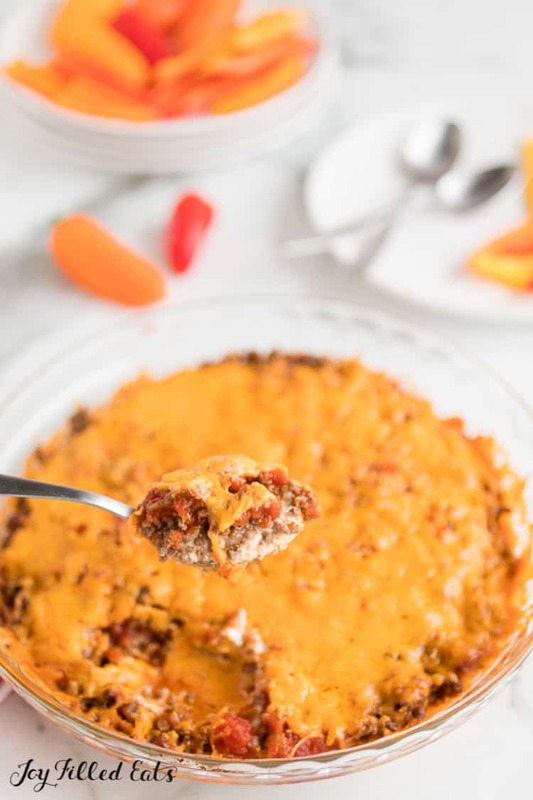 With just 5 Ingredients I really think this Layered Taco Dip with Meat will become a staple appetizer for your family too. I boosted up the amount of meat in this Easy Taco Dip with Meat so it is hearty enough to be part of dinner. We love this Easy Layered Taco Dip with Meat so much that I even make it for dinner sometimes. One of my kids’ favorite dinners is when we make a bunch of appetizers and finger foods and watch a movie or sports game together while munching. As I mentioned I have no problem just eating this Easy Layered Taco Dip with Meat with a spoon. 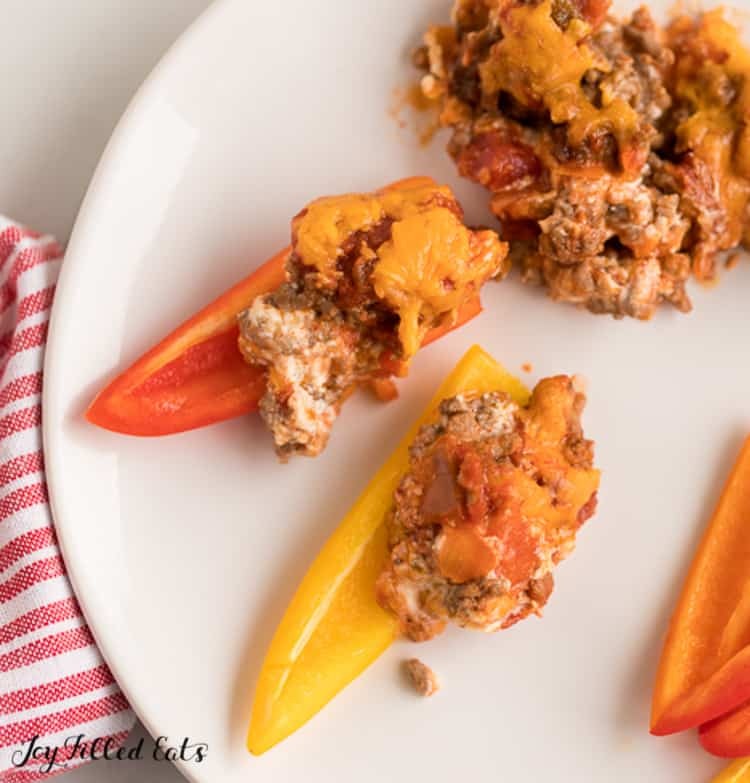 It is also great with low carb chips and fresh veggies, especially sweet peppers. You can use the same ingredients to make stuffed peppers. Instead of baking it in a pie plate just bake it inside the peppers. I used ground turkey but feel free to sub in beef or another ground meat of your choice. We even have friends who use venison in their tacos. We had this with a few friends and there was a little bit leftover. I was happy to eat it for lunch the next day with a spoon. No dippers required. taco seasoning <— click for my homemade blend – I make a big batch of taco seasoning every few months and use it for tacos and all of out other Mexican cravings. 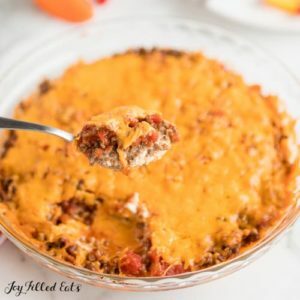 From my Easy Taco Casserole to Taco Stuffed Peppers it works great! Instructions: Layer ingredients. Bake. 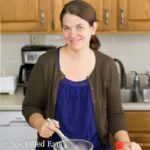 Easy Taco Dip is right! 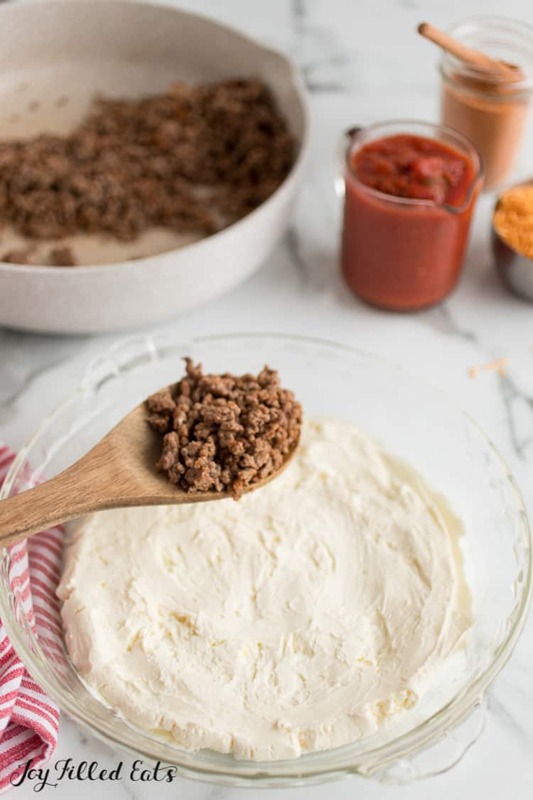 The base layer of cream cheese really kicks this up and turns it from plain old taco meat into a delicious dip. If your cream cheese is hard you can put it in the pie plate and then microwave it for 20 seconds to start the softening process. 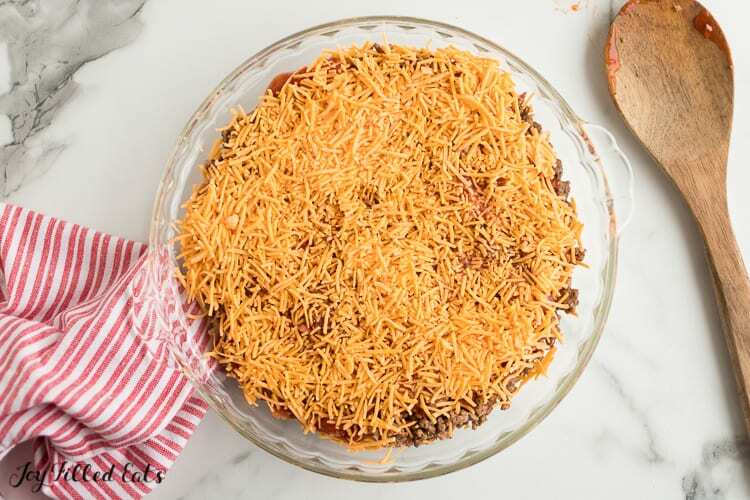 I hope this Easy Layered Taco Dip with Meat is the hit of your next party! Taco Dip. At any party or gathering, I've been to it is always one of the first appetizers to disappear. 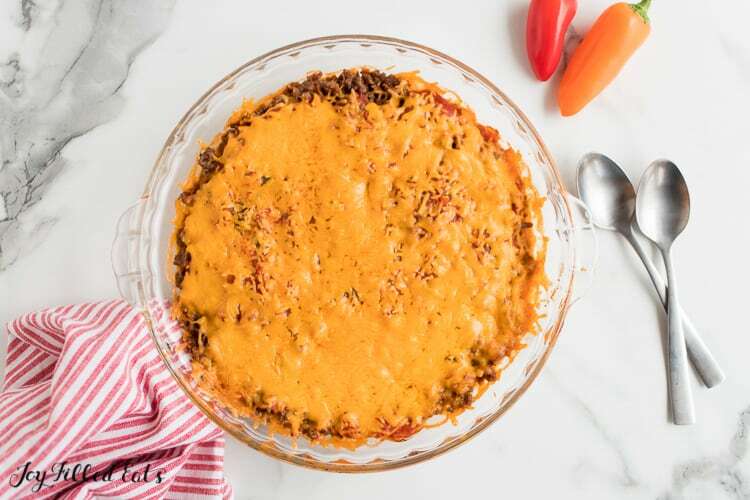 We love this Easy Layered Taco Dip with Meat so much that I even make it for dinner sometimes. 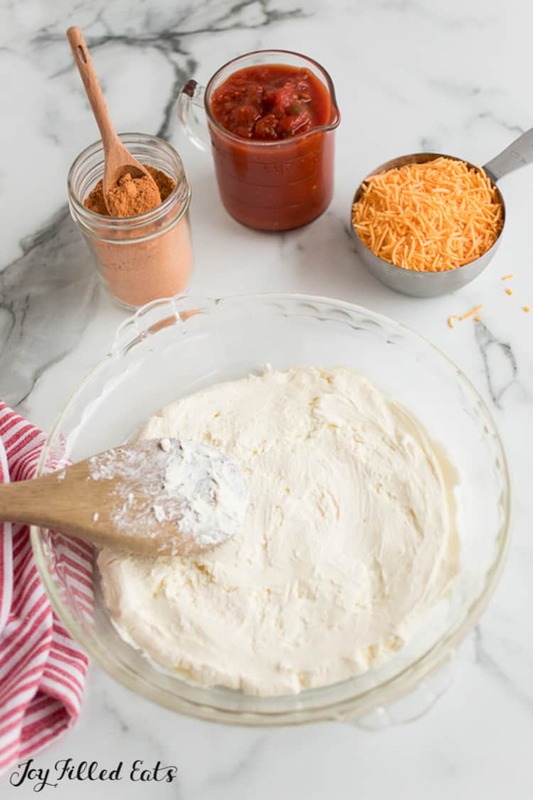 Spread the softened cream cheese in the bottom of a deep dish pie plate. Mix together the cooked meat and taco seasoning. Spread on top of the cream cheese. Spoon the salsa on top and spread. Sprinkle the cheese on. Bake for 25-30 minutes or until hot and golden. Originally Published August 27, 2017. Revised and Republished January 12, 2019. It's at the top of the recipe card. There are 10 servings. 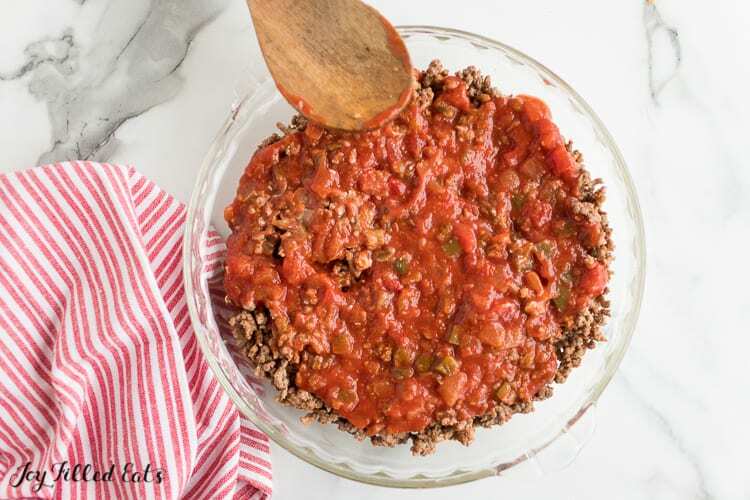 Love how easy it is to make this recipe - yummm! Yup! I like to scoop with raw peppers or thinly sliced zucchini. Can this be made ahead and frozen, then baked on game day? I think so. I haven't tried yet. You could definitely make the meat ahead of time and freeze that separately. And then just assemble right before baking. Can you tell us how you are doing with weight gain on this pregnancy thm style? I haven't been 100% on plan. I've gained about the same as my last couple pregnancies (30-35 pounds) but I started this pregnancy lower so I'm happy. :) My goal this time was to end up weighing less than my husband and I think I'm going to make it. lol.